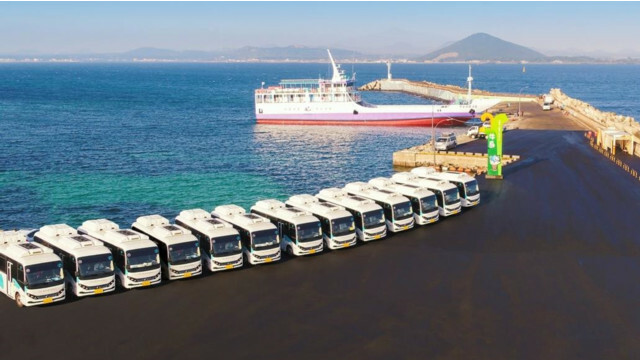 20 pure electric buses have been launched on Udo Island. While the buses were first introduced earlier in the year, the official launch was held on April 10. According to BYD, the company who makes the buses, this is the largest project of its kind in Northeast Asia. Each bus will be able to fit 15 people and the bus’s small size should make them perfect for the island's narrow roads. The bus, called eBus-7, is able to travel 200 kilometers on a single charge and only requires two-hours to be fully charged. Considering that the circumference of Udo is only 17 km, that would seem to be more than enough. An Udo Island official said that the buses are part of a plan to make Udo a green island so they can pass the nature on to future generations. The electric buses on Udo are not the only electric buses to be found on Jeju. Last year, Seogwipo introduced a number of full-size electric buses to routes on the southern side of the island. These buses have batteries that can be easily swapped meaning they don’t have to wait while being charged. Additionally, Jeju International Airport swapped some of its passenger transport buses for electric buses earlier this year.